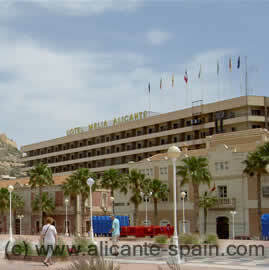 We have to find a decent Alicante hotel whenever we get clients visiting us. Finding a good hotel in alicante is pretty easy. A variety of quality hotels are located around downtown or close to the harbor area. From a sightseeing point of view, I would recommend the Melia Hotel Alicante, which lies perfectly in the harbor area. So far every customer of us was simply fascinated by the wonderful view into harbor bay. It lies very close to the city center, the harbor area and has a beach, the Playa del Postiguet just attached see this Alicante hotel in detail. Go for the Tryp Gran Sol Hotel Alicante (also a 4 star alicante hotel) and the only high building in downtown Alicante. Apart of all the usual hotel facilities you would expect from a 4 star alicante hotel, it hosts a spectacular restaurant nearly on top of the hotel. You should really go an see this restaurant, even if you are not guest at this Alicante hotel. In case both of these Alicante hotels are too expensive for you, I can recommend the Albahia Hotel Alicante. We used it twice, when we had friends “invading” our house and we needed some “extra room”. (More than 14 people visiting us here at the same time – oh, we had quite a time). The Albahia Hotel Alicante is a 3 star hotel with a wonderful view over the sea. Our friends liked it, because it was so close to the beach. However you will find a great amount of good hotels around the city. I personally would go for a hotel with at least 3 star rating, but this obviously depends on your budget. Areca Hotel in Torrellano is just about 2km away from the airport in Alicante. So the ideal place for short stopovers or business meetings. Detailed review of my favourite ” Alicante Airport Hotel ” is here.